Palestinian men gather things they found in the rubble of destroyed buildings in the Shejaiya residential district of Gaza City. 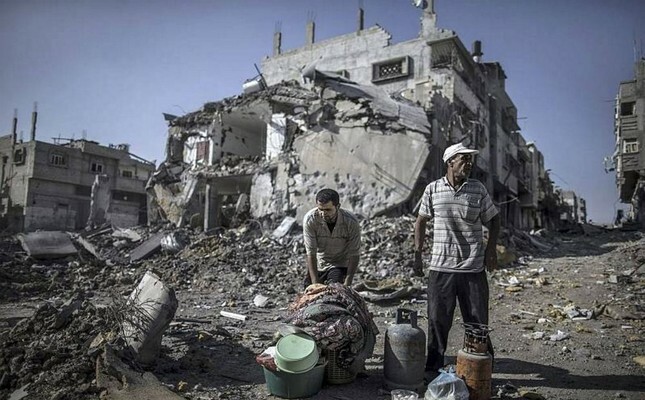 A report by the Council of Europe, titled "The humanitarian crisis in Gaza" has revealed that around 80 percent of nearly 2 million Gazans living under Israeli blockade are in need of humanitarian assistance, urging permanent solutions for Gaza's water and energy problems. The Council has expressed its concerns over the deteriorating humanitarian situation in Gaza, where 75,000 people are still displaced and some 43 percent of the population are unemployed, a figure that reaches 60 percent among youth. According to a recent report by the United Nations (U.N.) Conference on Trade and Development, due to severe damage to the coastal aquifer and overall environmental degradation, Gaza is in danger of becoming unlivable by 2020. The report called for an end to the blockade, the Israeli occupation of the West Bank and a return to the negations table by Palestinian and Israeli leaders to realize the Palestinian dream of statehood. The Assembly encouraged both Palestine and Israel for the two-state solution, which it though was the only way to solve the Gaza situation. The Assembly also called on its member states to provide necessary resources to the United Nations Relief and Works Agency for Palestine Refugees (UNRWA) and the United Nations Office for the Coordination of Humanitarian Affairs (UNOCHA) for their emergency assistance projects in Gaza. The report also called an international conference on the reconstruction of Gaza. Gaza, controlled by Hamas, has been under Israel and Egyptian blockade since 2007 (except during the Mohammed Morsi era). After the Gaza war, which left more than 2,000 dead and 100,000 homeless in 2014, restoring the city has not been successful, as calls for aid made by international communities were left unanswered, resulting in an even bigger humanitarian crisis. Due to the blockade, the city has also been left with no electricity, water, medicine, food and fuel. Children are in need of clothes, diapers and baby food, while families are in need of shelter, blankets, heaters and cleaning supplies. The sea blockade by Israeli naval forces has caused damage to the Gazan fishing industry. Palestinian fishing was originally to be permitted up to 20 nautical miles offshore under the Gaza-Jericho Agreement in 1994. The agreement was, however, not implemented, and Israel allows fishermen to travel only three nautical miles offshore. The UNOCHA has estimated that Gazan fishermen need to journey at least 12–15 nautical miles from the shore to catch larger shoals. In Oct. 2016, the Zaytouna-Olivia, a part of the Women's Boat to Gaza, an initiative of the International Freedom Flotilla Coalition, was sailing from Barcelona when it was stopped by the Israeli navy with 13 of its passengers onboard, including several parliamentarians, an Olympic athlete, a retired U.S. army colonel and Nobel Peace Prize Laureate Mairead Maguire of Northern Ireland. In July, 2015, the vessel Freedom Flotilla III was stopped by Israel and prevented from breaking the blockade imposed on Gaza. The second Gaza Freedom Flotilla took place in 2012. It was also forced to turn back. The first Gaza Freedom Flotilla expedition in May 2010 ended in tragedy, after Israeli commandos killed 10 Turkish nationals, including 19-year-old Furkan Doğan, an American of Turkish origin, in a bloody raid on the Mavi Marmara. In addition, following the military coup against Egypt's Mohammed Morsi, a Muslim Brotherhood leader, the Egyptian authorities in 2015 started building fish farms along the Gaza border in order to shut down the remaining tunnels. The Egyptian military has also continued its crackdown on the underground tunnels that connect the Sinai and Gaza. These tunnels are a lifeline for more than 2 million Gazans to get basic needs from Egypt. The tunnels are mainly located at Rafah on the border of the Gaza Strip and Egypt, and are used for various purposes. They have been used to transport people (in and out) as well as commercial materials like medicine, food, clothes and vehicle parts into Gaza. The World Bank estimated in 2015 that the gross domestic product (GDP) loss caused by the blockade since 2007 was above 50 percent. Gaza's exports have virtually disappeared since the imposition of the 2007 blockade, something former U.N. Secretary-General Ban Ki-moon had described as a "collective punishment."